is a seventeenth century contrivance formed from the estates of George Mackenzie, Sheriff of Cromarty, after he gained royal favour. 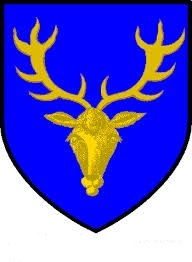 Later ennobled as the Earl of Cromarty, his arms depicted a golden stag’s head against a blue field. Ross and Cromarty District Council. Whilst the Mackenzie arms remain the preserve of an individual armiger, a potential flag for the county, suggested by Philip Tibbetts, retains the basic theme but replaces blue with black, to recall the “Black Isle” peninsular, upon which the town of Cromarty itself sits and around which the county was formed. Cromartyshire being so closely linked with the county of Ross, where a stag is also a much used local device, a logical arrangement is for these two closely entwined and adjacent territories to adopt similar stag bearing flags, in distinct colours, as presented at the Ross page. This entry was posted in Cromartyshire. Bookmark the permalink.